I have a new JulieG by Jesse's Girl polish to show you today. Jesse's Girl released 27 new shades for the JulieG line this year. I do not have a Rite Aid here, so my experience with this brand has been through people sending me them or purchasing them online. The JulieG line of polishes is awesome! I've always been impressed with their selection and the price. This is an awesome green! Holla-peno is a medium muted green creme. I'm not typically a green polish girl, but this polish caught my eye. 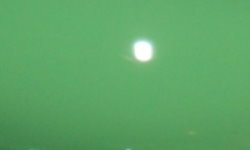 This is not a typical green shade I have seen. I love that it has a softness and dustiness to it which makes it original. I also like that this leans more towards the green or the yellow-green side rather than a blue-green side. This applied really nicely, and I do not have any complaints about formula. I will say though it did take me a few times to realize the name was a reference to jalapeno. The simplest things always boggle my mind. Oy. I purchased this from the Jesse's Girl website for $3.99. You can also find this one at Rite Aid. Pretty! How does Holla-Peno compare to Essie Mint Mojito? Pretty! How does this compare to Essie Mojito Madness? i have never really looked at the jesse girl polishes at rite aid but, after gum drops, i am definitely doing to start keeping an eye out for them. This is like, the perfect green polish - exactly what I love! I just posted a bottle comp pic on my FB page. Holla-peno is a bit lighter and more yellow toned. Thanks I just posted a bottle comp pic on my FB page. Holla-peno is a bit lighter and more yellow toned. Love the color and it's perfect for spring. I like this. I love greens and this is a little different than most greens I wear!